Trip to Aral Sea in Kazakhstan. "The bottom of the Aral Sea is a really exciting object. After the lake began to dry up and the huge part of bottom was exposed the scientists found ruins of two ancient townships dated by the XI - XIV centuries, remains of people, animals, trees where there once was a big water. It means that level of the Aral Sea fluctuated earlier and most likely, the sea had already dried up at least once. Some scientists even compared Aral to Atlantis which has unexpectedly departed to a seabed"
Tours to Aral Sea in Kazakhstan. Aral Sea is the lake that is located in Turan Lowland. With regard to its size, the Aral Sea is the second in Kazakhstan and it is the fourth in the world. It is situated between Kazakhstan and Uzbekistan. In 1961 the water level in the Aral Sea was 53 m above the level. Its area was 66.1 thousand km2, water volume was 1064 km3, length was 428 km. Due to the intensive use of the water from the rivers in the economy, this area was subject to significant man-caused impact and as a result in 2002 the level of the sea went down by 20 m.
This is related to irrevocable water intake that flows into the sea. Thus, Syrdariya River from 1974 and Amudariya from 1982 were not always reaching the sea. There were 1100 islands in the Aral Sea, part of them like Kokaral, Barsakelmes and Revival Island became the peninsulas, i.e. joined with the land. Due to the reduction of the water level in the Aral Sea, the territory occupied by it was diminished by 40 thousand km2. The sea was divided into two parts: Large Aral and Small Aral. The banks of the lake ebbed by 100 - 150 km. The dried up sea bed turned into the alkaline lands, deserted banks became covered with salt and sand. In order to save Aral in 1992 the first “Ecologic map of Aral Region” was created in Kazakh air-space ecological centre in Baikonur. In 1994 the Central Asian countries established Aral Salvation Fund. The Soviet technocrats who came up with the idea of irrigating the steppe using the Aral Sea’s main water sources obviously never considered the monstrous effect it would have on this once renowned and revered body of water. Global warming has also had a hand, with glaciers receding and rising average temperatures adding to the Aral Sea's woes. Storms now carry sand and salt grains from the dry seabed right across the Central Asian steppe, onto the glaciers of the Tien Shan and even as far as the Himalaya. 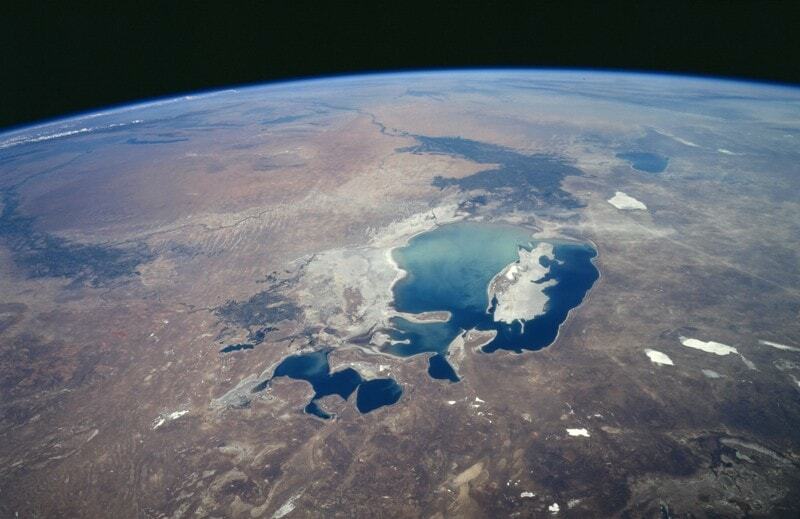 The Aral Sea's huge volume of water once influenced and moderated Central Asia's extreme continental climate - the sea was large enough to generate rain clouds. Now, however, the water volume is insufficient for this, and a vast region of once habitable land is falling into desertification. Though resistant plants and bushes still grow on the dry, salty seabed, the area is becoming drier, colder in winter and hotter in summer. Aral Sea , salt lake, SW Kazakhstan and NW Uzbekistan, E of the Caspian Sea in an area of interior drainage. To the north and west are the edges of the arid Ustyurt Plateau; the Kyzyl Kum desert stretches to the southeast. As recently as the 1970s it was the world's fourth largest lake, c.26,000 sq mi (67,300 sq km) in area and c.260 mi (420 km) long and c.175 mi (280 km) wide. Fed by the Syr Darya and Amu Daryarivers, it was generally very shallow, attaining a maximum depth of c.180 ft (58 m). In the 1950s the Soviet Uniondecided to cultivate cotton in the region, and since the early 1960s the Syr Darya and Amu Darya have been used for large-scale irrigation, causing a drop in the flow of freshwater into the sea. The sea is, as a result, now greatly reduced, mainly occupying two basins in the western and northern sections of its former lakebed by 2009, about a tenth of its former size in area. The sea formerly supported local fishing and was navigable from Muinak to Aral. As the Aral has retreated from its former shores, due to the combined effects of evaporation and water diversion, major environmental problems have resulted. The quality of the remaining water has deteriorated, increased salinity has killed fish, and the health of those living along the shore has suffered. Regional weather has been affected as well, becoming harsher as the sea's moderating climatic influence has diminished. Vozrozhdeniye, the site of a Soviet germ warfare waste dump, is a former island that is no longer isolated from the surrounding region; in 2001 the United States agreed to help clean up the site. Geologically separate from the Caspian Sea since the last Ice Age, the Aral Sea was once only slightly saline. Mentioned in Arab writings of the Xh century, it was called the Khwarazm (or Khorezm) Sea by later Arab geographers. It was reached in the XVII century by Russians, who called it the Sinyeye More (Blue Sea). The United Nations has estimated that the sea will essentially disappear by 2020 if nothing is done to reverse its decline. The Kok-Aral Dam (completed 2005) was constructed to enclose the small northern section (in Kazakhstan), which has revived, but it is a fraction of the former sea. The aim was to prevent the water that poured into the northern basin from spilling into the south, thus gradually raising the water level in the northern lake. Nine months after its construction the dam overflowed and breached. In 1996, a new dam was built, 14 kilometres long and up to 30 metres wide; it was strengthened in 1998. This great civil initiative in Kazakhstan gave people hope, as they held their breath and watched the water level rise and the first positive signs of improvement that resulted. Then, in 1999, a sand storm of hideous force tore the dam apart and part of the water gain was lost to the southern basin's lake, which is much larger. However, hope has been revived once more. The World Bank has financed 13-kilometre-long barrier dyke at the mouth of the Syr Darya. Watching the environmental disaster worsen as the water evaporated at increasing rates from the Aral Sea's surface, and understanding that it is practically impossible to save the whole remaining body of water, the decision was finally made to attempt to save and restore the northern "Lesser Aral". The subsequent prevention of water loss to the south has led to a significant increase in water level in the Lesser Aral. As a result the salinity is reducing, and fishing is becoming viable once again. It is hoped that the water surface will increase to about 600 square kilometres. Meanwhile, scientists are looking into ways to reduce wind erosion of sand and drifting salt. New plantation methods are now being tested on the eastern shore of the Aral Sea. A bathing beach has been built on the large freshwater lake Kamyslybas near the Lesser Aral to improve quality of life for the local residents.